The poet Rabbie Burns is often described as the Scottish National Bard, and quite understandably so. But Burns, like Shakespeare and Joyce, was certainly studied and admired far out beyond his homeland and by people of completely different ethnic, cultural and religious backgrounds. No wonder, as he was a great liver of life and lover of life - had profound insights into humanity and an uncanny ability to express this orally and in writing. You can see why in Northern Ireland in recent times, and with Northern Ireland being Northern Ireland, there have been expressions of hostility at the enthusiastic celebrations of Rabbie Burns in the month of January by “Ulster-Scots” groups. Ulster-Scots enthusiasts have been accused of claiming Burns as their own, while not understanding the man and not sharing his values. As a Burns enthusiast myself, and someone who identifies himself as an Ulster-Scot, I certainly have not come across, anyone of similar ilk to myself, who does not fully understand the universal appeal of Burns and who has ever made any claims of ownership on the works of Burns. This does not mean however, that we Ulster-Scots, should feel guilty in any way, for embracing and fervently celebrating the birthday of one of the greatest writers of all time, just because we happen to share ethnic, cultural and religious backgrounds and have had similar political and philosophical ideals. Now, I certainly do not think I have any more right than others to embrace Burns, as I wouldn’t want anyone telling me that I shouldn’t celebrate the works of Leonard Cohen and Bob Dylan because I’m not of North American Jewish stock. On the other hand though, we need to examine the reasons for this particular love of Burns, among many Ulster-Scots today. First of all, it should be recognized, that many of the inhabitants of Ulster during Burns’ lifetime were descendants of recent settlers who had come over from Burns’ part of Scotland. In 1786, just after the first edition of Burns’ poems and songs was published in Kilmarnock, his verses began to appear regularly in the Belfast Newsletter . A year later a second edition was published in Belfast by James Magee and so his works became widely discussed, verses were quoted and his songs were sung in many parts of Ulster. The Ayrshire ploughman had won the hearts of kindred spirits in Ulster - several of whom made special trips across the sheugh in hopes of meeting the literary genius in person. A shared religion, by many, was no doubt a factor in the Ulster response to Burns. He was a Presbyterian, as were most of the Scottish settlers. At the time of Burns, the church in Scotland saw great conflict between the auld licht and the new licht and Burns got right into the fray through his poems and letters. This was also the cause of much theological debate in Ulster at the time. It is obvious why the Ulster-Scots of his time, would have echoed these sentiments. The “Scotch-Irish” are attributed with being the chief instigators and to being at the forefront of all the stages of the American Revolution. Again, the similarity with opinion and passion in Ulster is clear - the success of the French Revolution was celebrated on the streets of Belfast and as a consequence, Belfast Presbyterians formed the United Irishmen Society in 1791. Again, there are obvious parallels with the historic struggles of the Ulster-Scots people - British, yet always at odds with the British Establishment and prepared to fight for or against that establishment depending on what offered the greatest threat to the freedom and democratic rights of “the people.” Too much emphasis could be placed on Burns’ political ideals, however; no doubt they were not the main draw to the average Burns enthusiast in Ulster. What makes Burns stand out from most other great poets, was that he lived life to its absolute fullest. While other academics can portray the wonders of life in beautiful language as a result of their observation and communication skills - Burns went out there and got into the thick of it. His social relationships and interactions were exceptional by any standards, and the extent of his sexual relationships with women was outrageous. He was therefore able to provide great insight into the delicacies, perplexities, calamities, follies and profundities of life, with honest emotion. 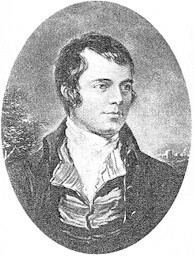 Many of Burns’ poems and songs were in a vernacular that included an extensive use of Scots words and grammar. Very little of the subtleties and great humour would have been lost, therefore, on the average reader of Burns in Ulster - familiar with the Scots language. 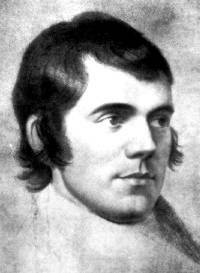 When I was growing up in rural County Antrim in the 1950’s and ‘60’s, the poems and songs of Burns, could still be heard - handed down through the generations by admirers of his work. In more recent years, this appreciation of Burns has been on the wane, due obviously to the change in cultural focus as a result of modern communications, and the popularisation and commercialisation of an Irish culture that did not include Burns.